According to US Army (R) Lt. Col. Anthony Shaffer, who was just spotted on FOXNews while flipping through the channels on the TV, TLAM is a term meant to describe "putting iron on target". Seriously? He just described TLAMs and Tomahawks being used "to strike 20 targets" in Libya. For those of you who aren't familiar with the term, TLAM is Tomahawk Land Attack Missile. Translation: it's a Tomahawk used to target ground targets, as opposed to the UGM-109B TASM, or Tomahawk Anti-Ship Missile. It's not a big deal, but I did find it funny. Maybe next time it'd be a good idea to ask someone more likely to have a clue what they're talking about to deal with current operations. What a terrorism expert can offer about direct action between nation states is beyond me, and in this case it was very little. The best part is that not five minutes later a reporter accurately referred to TLAM Tomahawks! So, the lesson for today is to take whatever you hear from an "expert" with a grain of salt. I'm not removing myself from that category either; if you found me describing something outside my own fields of study, I'd expect to be treated the same way. 1. For the time being, Libyan SAM systems will remain in the SAM Site Overview file. Yes, most of them have probably been obliterated by now. But, my policy has always been to base the file on available overhead imagery, not speculation. As newer post-strike imagery filters into Google Earth, Terra Server, and other online sources, I'll adjust the sites in the file accordingly. Given Google's quick release of GeoEye imagery relating to the crisis in Japan, that may happen sooner rather than later. Current Events: undecided at this point. Will not deal with Libya as the issue has been dealt with extensively here, and frankly it won't be truly current by the mid-April release date anymore. Air Defense: The S-300P/S-400 This is an expanded, updated version of this feature. Historical Perspective: SAM Modernization in China A chronological look at the modernization of China's SAM network as newer systems became available through import or native development. Strategic Warfare: War of the Weird Presenting a look at two thoroughly different development paths intended to field a survivable cruise missile during the latter stages of the Cold War. This will compare and contrast the US SENIOR PROM and the USSR's Meteorit. Reading List: Military Classics Self-explanatory, really. I'll be providing an overview of selected military classics such as Clausewitz's On War, Guderian's Achtung! Panzer, and others. 3. What's missing from the last time I posted subsription info? US .gov and .mil e-mail addresses may now subscribe to the service. In order to do this, enter Subscribe PDF MIL in the subject line of your e-mail. I'm going to try this out by keeping a separate mailing list. One of the reasons these addresses were initially "banned" was because I used to have one! Often e-mail links were deleted and certain websites could not be acessed, potentially preventing a subscriber from a) receiving the download link or b) accessing the download site. By keeping them separate, I can try this out and then manage a separate distribution system should it be required (currently Google Documents is used, and I have no clue if a .gov or .mil user would be able to access the site). Plus, by doing this now, the major influx of initial subscriber e-mails has already been processed, saving me the trouble of having to sift through hundreds of e-mails. Lastly, welcome to all of the new readers here. As various media outlets and websites linked to the Libyan analysis pieces, site traffic has exploded over the last four days, resulting in a month's worth of traffic since Friday. Even more amusing is the #1 search result for Libyan NFZ in Google! 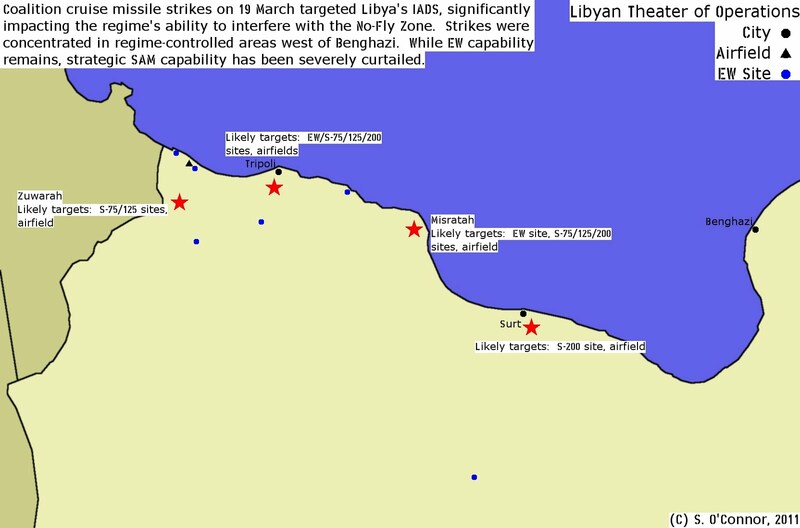 Following the initial cruise missile strikes on 19 March, the Pentagon released a document illustrating the general areas where targets were attacked. As expected for an attack on Libyan IADS architecture, the strike locations corresponded to regions with deployed EW assets and S-75, S-125, and S-200 missile batteries. The graphic below illustrates the post-strike state of the Libyan IADS, presuming that all SAM systems were disabled in regions targeted by cruise missile strikes. While the Qaddafi regime is no longer assessed to control operational strategic SAM batteries in the NFZ region, numerous EW facilities still remain. These facilities allow the regime to maintain a degree of situational awareness, provided they are not under constant electronic attack. 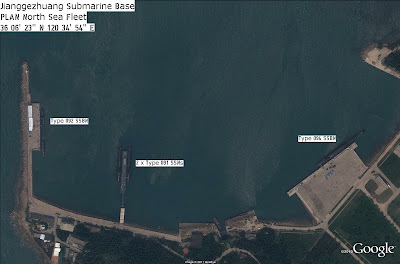 Furthermore, no effort was made to strike S-75 or S-125 batteries deep inland. 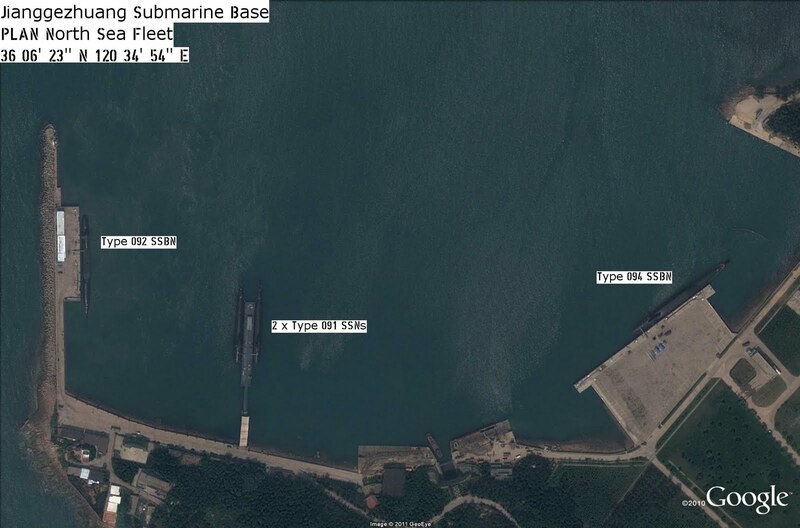 Sabha is still defended by an S-75 and S-125 battery, and contains a garrison facility which could be used to reconstitute SAM units damaged or destroyed in the March 19th attacks. If the coalition is unwilling to strike targets outside the established NFZ, the Qaddafi regime may be able to transport SAM components to its periphery. This would theoretically enable targets operating in the southern portions of the NFZ to be engaged, creating an interesting scenario where the coalition would have to either restrict flight in sections of the NFZ or attack targets outside of the NFZ to maintain its integrity. Such a course of action could potentially see increased protest from nations such as China and India, bringing into question the continued value and effectiveness of the NFZ as a whole. Also, Western nations attacking targets outside of the NFZ could result in a significant loss of support from the Arab League. If there is a lesson to be learned from the March 19th decapitation strikes on Qaddafi's IADS, it is that nations relying on Soviet-era SAM systems no longer pose a significant threat to a modern, well-equipped military arm. While current-generation Russian-made SAM systems rank among the most sophisticated and capable in the world, the era in which nations could rely on elderly Soviet-era systems such as the S-75 or S-200 to provide a credible degree of air defense capability has decisively ended. Claims by the Pentagon that Libya possessed a high-threat IADS network were technologically unfounded, in much the same way that the same claims made about iraq in 1991 were also proven to be extreme exaggerations. 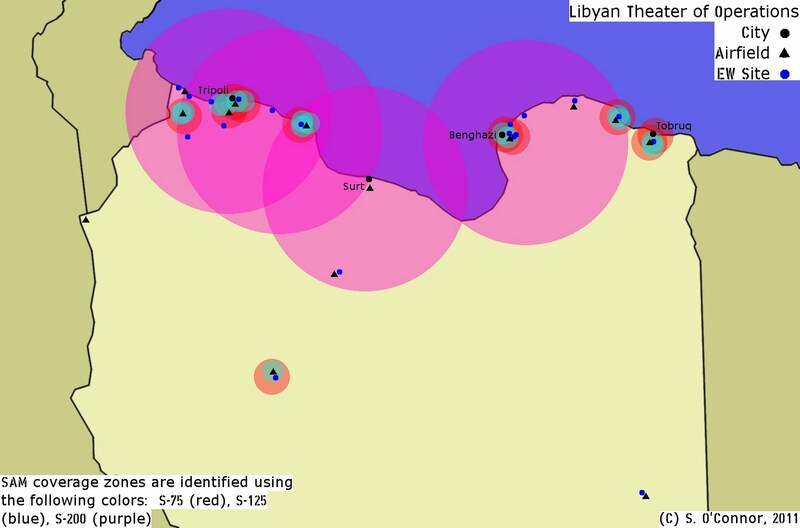 As we are all aware by now, UN-backed military action is being taken against Libya. 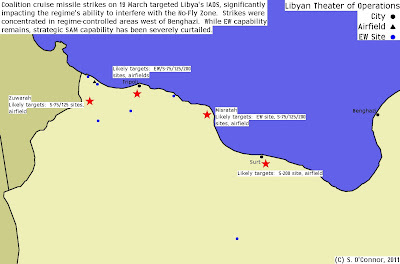 As predicted earlier, the opening salvo consisted primarily of cruise missile strikes against the air defense network, opening the door for allied aircraft to operate over Libya in a lower threat environment. 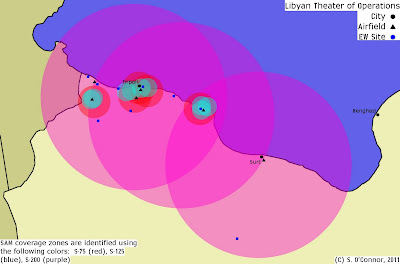 In an amusing development, here's CNN's John King saying pretty much the exact same thing I did once he gets around to talking about the air defenses: VIDEO Readers have already noted that the range rings and color schemes used to identify Libyan SAM sites are the same ones I used in the SAM Site Overview! It appears that my SAM Site Overview file is now a CNN media source, they even used the native system designators that I do rather than the more common Westernised names usually found in the Western press and media when dealing with Soviet-era systems. My attempts to control the world are clearly moving ahead as planned. Seriously, if anyone else notices something like this, let me know. I do track stuff like this, in part to make my resume more amusing and in part because it adds credibility when I am asked to provide organizations with information. 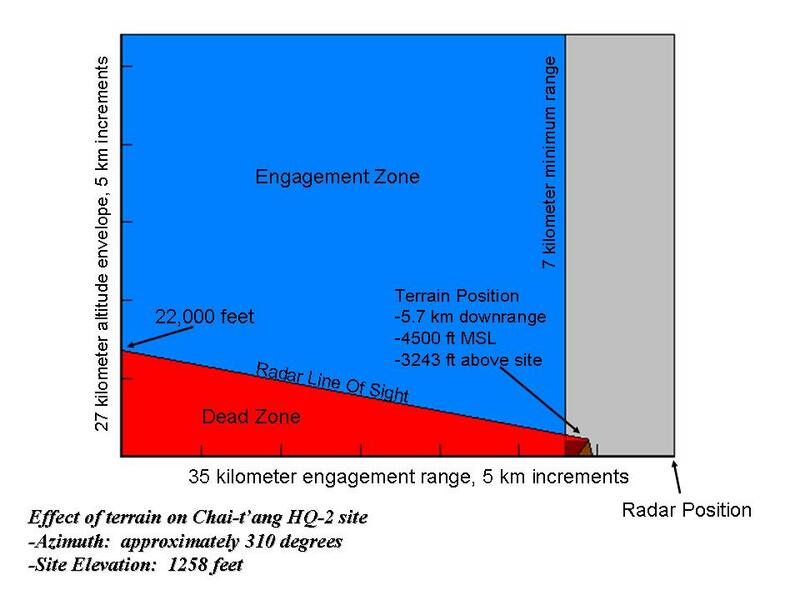 What I want to do (ignoring the text bits) is show the engagement zone as an area graph, but be able to overlay multiple zones on top of each other. 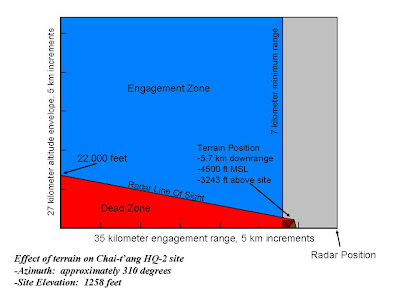 Picture the blue part of the above HQ-2 zone overlaid on top of a different colored HQ-9 zone, for instance, showing the disparity in capabilities. Using a graphing or charting application will allow me to do this in much less time than having to draw the entire thing manually, which is what I did for the HQ-2 graph. Either MS Excel is not cooperating, or I have no clue what I'm doing. Either one is possible. So if you have an idea of a program that I can use to graph areas like that, with set minimum and mazimum values in the X (range) and Y (altitude) axes, let me know. Just don't bring up gnuplot; I tried that one and it made my programming-illiterate brain hurt. Apparently, I seem to have once again been useful. 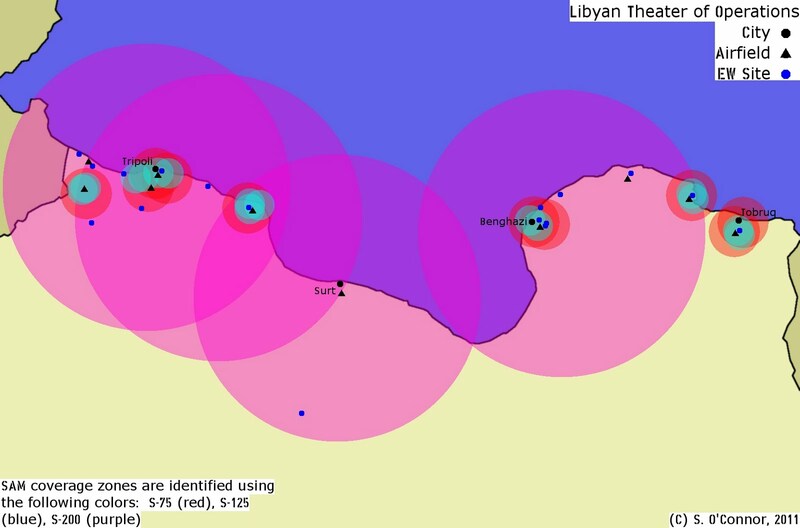 Back in 2010, I wrote about Libya's SAM Network. Over the past week or so media outlets all over the world have picked it up as a source regarding the then-potential UN No-FLy Zone. One reader even noticed it mentioned live on the air on Al Jazeera. In light of the fact that there aren't any other significant references out there yet, I'm working on something which will be posted here later Friday (much later, it's almost 2AM right now...expecting to see something in two hours will result in disappointment) dealing with the potential impact of Libya's SAM systems on a NFZ. Check back later on today (maybe late tonight/early Saturday, I teach Friday evenings) to see what I can come up with. The March 2011 issue of the I&A PDF has now been released to subscribers. Following on the request of numerous people joining the mailing list following the release of the first issue, both issues are available for download. The previous issues will always be available for download each month, until the new calendar year when Volume 2 begins. So, if you sign up late, you won't ever have to worry about missing anything! Well, until the end of the year. At that point I will compile the entire year's worth of issues into a separate volume and release it to the global community rather than the subscribers. -March 2011 Links, Source List, and What Is It? Also, a supplementary KML file is being sent with the download link to allow readers to view the locations discussed in the March issue. This will be a standard feature from now on. Lastly, yes, I am still going to update the SAM Site Overview file. Preparing the Chinese Hybrid SAM Sites article actually led me to discover some errors that needed to be corrected, apart from the usual adding of new sites. I've got the file compiled, it will be uploaded tomorrow morning here, along with the update information. And now that I have the whole PDF thing sorted out, you'll start to see some more content here as well. My intent was never to get rid of this site entirely, just to change things up a bit!